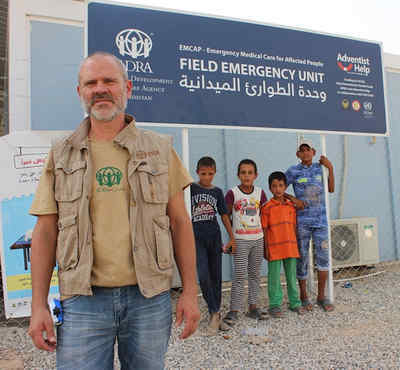 Dismayed by news reports of starving people in Africa, Marcelo Dornelles left a comfortable life in Brazil to provide ADRA relief in the war-torn countries of Mozambique, Angola, and Iraq. Although only 48, Marcelo has white hair and a well-lined face that testify to years of arduous humanitarian work amid bomb explosions, intense sun, severe cold, and pounding rain. He wouldn’t change a thing. “I was very dissatisfied in 1990, even though I had a comfortable life”, Marcelo said in an interview in the Iraqi city of Erbil, where he worked as director of ADRA Kurdistan. “I felt a desire to help when I saw television images of people dying of hunger in Ethiopia and Somalia, where there was war at the time. I knew God was calling me”. His first assignment was to help the Adventist Development and Relief Agency establish food programs for people displaced by conflict and drought in 100 villages in Mozambique. The country had been mired in civil war since 1977, and a peace agreement would only be reached in 1992. “When I arrived, I realized that the situation was more complicated than I had thought”, Marcelo said. “But I could not turn back. Much help was needed”. He worked in Mozambique for eight months, and he said his desire to help others only grew stronger. But a medical emergency involving his mother prompted him to cut short his work and return to Brazil to care for her. His next assignment, to Angola, brought him to a country in the midst of a 27-year civil war. His first years were horrific as he saw desperate people eat shoes and dead dogs. During a military offensive in 1993, he saved 20 children from starvation and bomb blasts by sheltering them in his home in the provincial capital of Malanje in northern Angola. “What I saw in the streets was terrible, dozens of children who were only skin and bones dying of hunger”, he said. “I could not bear such misery. So, I gathered the children whom I met, brought them to my house, and fed them”. He also worked with ADRA to place more than 200 orphaned children with Adventist families in Malanje. In 2016, Marcelo took moved to Iraq to help internally displaced people there. “He’s a guy with a big heart”, said Liander Reis, a Brazilian who works as chief financial officer for ADRA Kurdistan.